Here is a video of making one of 12 upper extension arms. These were a bit more complicated than the lower arms since there are 3 bearings on each one. 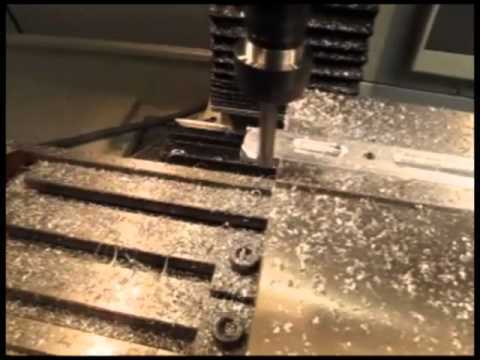 This video is a bit longer than most of the previous videos as I left in all the milling operations for this piece. The next part are the 12 knee connectors. These connect to one end of the upper and lower extensions and to the bottom and impact sensor housing. The 12 Knee connectors are now completed. Slowly getting all the parts for 6 legs done. It's been a little bit like a slow assembly line in the basement but it's coming together. 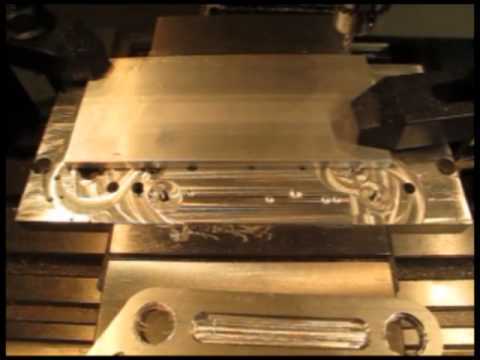 Here is a video of the machining for this part. 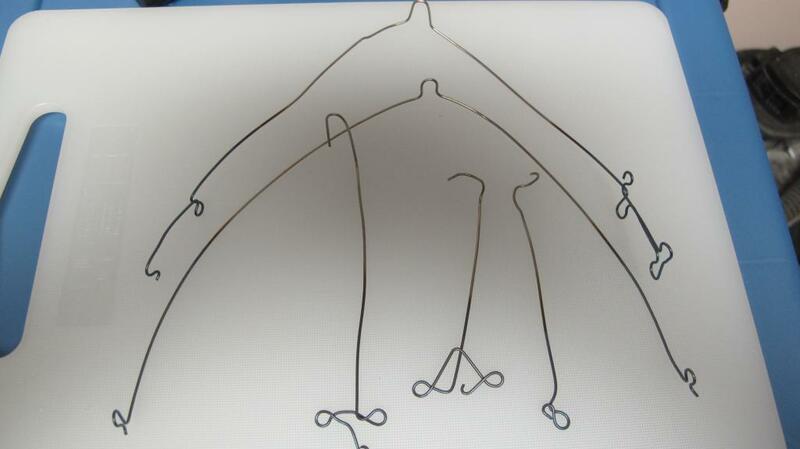 The next part on the agenda are the upper and lower leg swivels, these are the points that the leg rotates on. 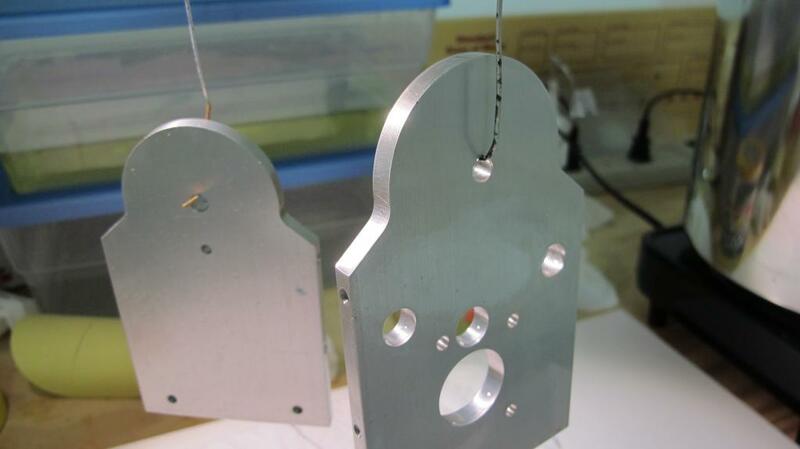 These will be machined using a fixture to hold them in place due to their size. I'm still hoping to complete all the mill work by the end of the year. 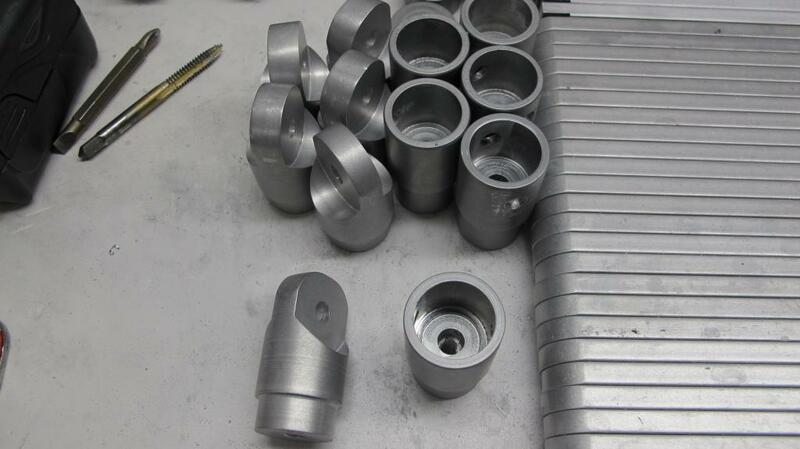 I will still have to manufacture 6 couplings per leg using the a manual lathe, that will take extra time (a CNC lathe would be nice around then....) The overall goal is to get the mechanical portions of all 6 legs complete prior to spring. There may be some obstacles in the way of that plan, vacation plans, an outage at work and a month long class I am required to attend for work. We shall see how it goes. In the meantime I'll continue to document my progress, this thread helps keep me motivated! 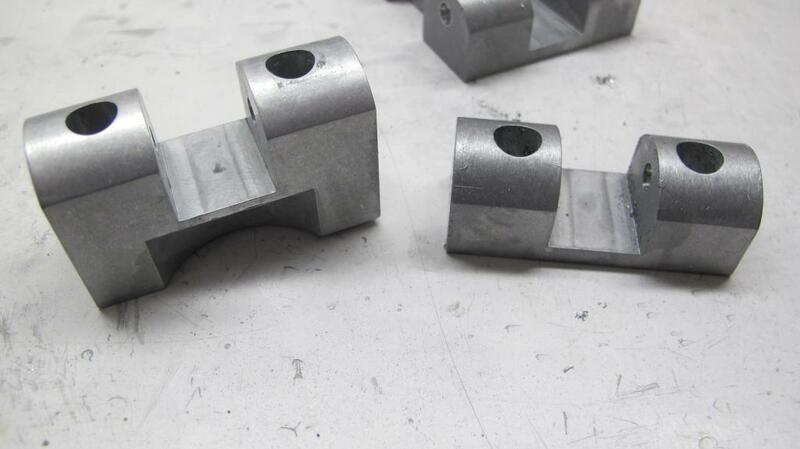 I got a good start today and finished up machining the 6 lower leg pivots. This is a relatively simple part so I didn't video it but I did take photos. Unfortunately the SD card won't mount so I'll have to pull them using another computer later. I plan on working on the upper leg swivels during the week and may get started on the main leg support pieces. Once those are done I can get back to working on the last pantograph piece, the part shaped like a boomerang. There is a left and a right part for these and so far they have been the hardest to machine due to the number of steps and tool changes involved. I'm getting far enough along that I'll need to start getting serious about anodizing, That is one item I'm really interested in learning as it's very different from the types of projects I've ever tried to do before. Stay tuned, I'll keep everyone up to date with the progress! Finally got the computer card reader to start working again! I finished up both the upper and lower leg swing plates. These are pretty simple assemblies so I only took a photos of the lower swing plate; both plates need holes drilled and tapped on the sides for attaching the main leg struts. 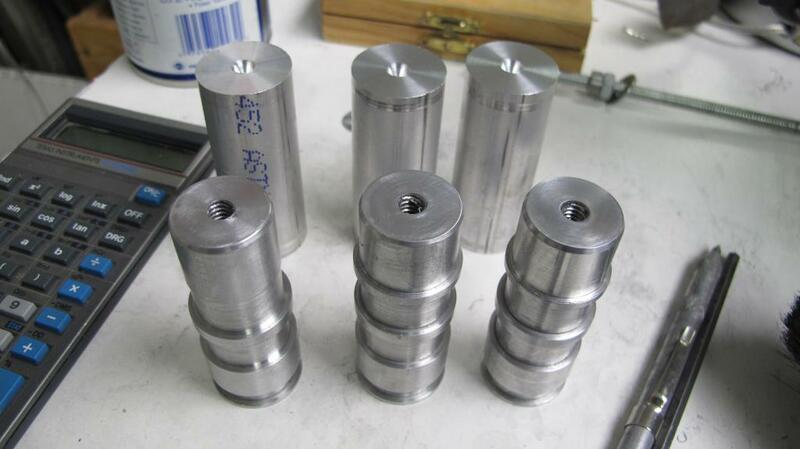 The first photo is the stacks of finished parts waiting to be deburred. 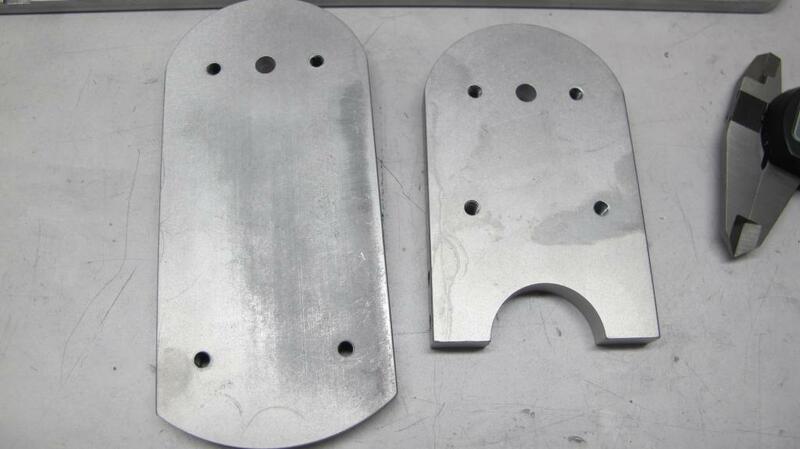 The second photo are the lower swivel plates. 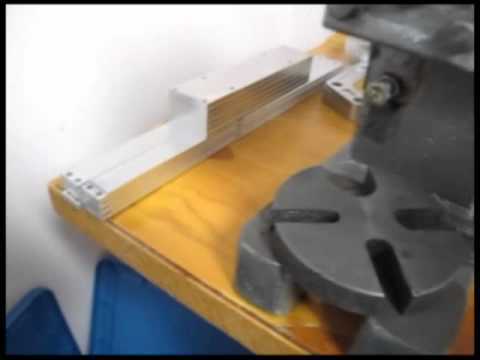 Here is short video of the machining for the Swing Arm connector on the pantograph. 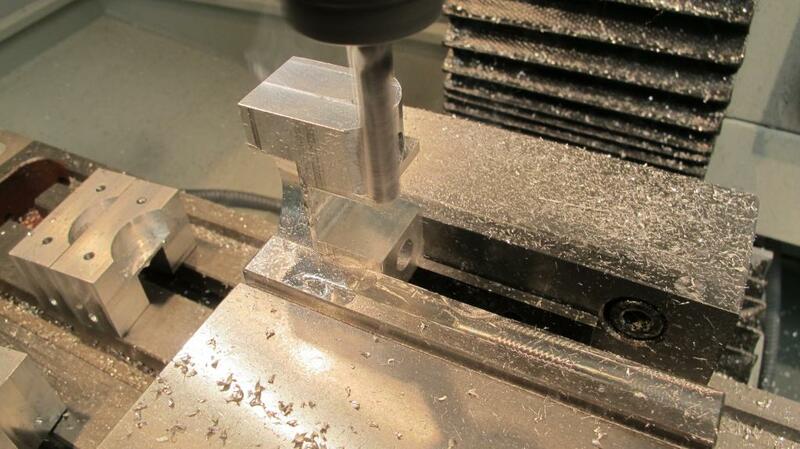 This part is a bit more intricate than the others so it takes around 20-25 minutes to machine each one. I've completed 6 of the left side pieces, now I have to set up for the right side version. It's still coming together slowly but surely. 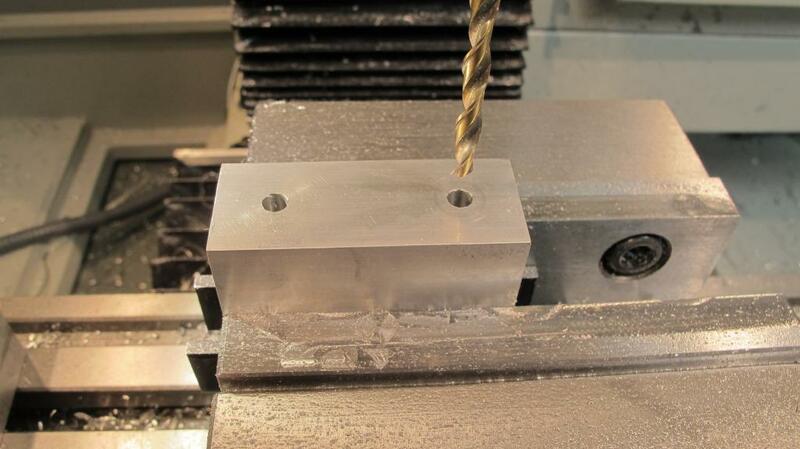 Machining of the major pieces is still on track to be completed around the end of the year. Still a lot of lathe work to go yet! I started using the vibratory bowl to deburr and remove the remaining tool marks. This takes around 8-10 hours for each part and I can only do about 12 parts at a time. This gives the finished parts a satin finish but I want something a bit smoother so I'll also run each part using walnut shells and Red Rouge for about 24 hours. That should give a nice gloss finish prior to anodizing. Bob, what will the total weight of the robot be when finished? Also, I think you got me motivated to use my desktop CNC machine again. I just finished making some large quadcopter booms. I notice that as time passes I run into all kinds of setup problems: CAM software hard lock might be missing, getting files to the CNC computer has permission problems, etc. But everything is working again, so I'll start making parts myself. Thanks for getting me back into it. My guess is that it will end up around 175 lbs. glad I can be a motivator, usually I'm just a bad example... I hope to have most of the mechanical parts done and put together for the get together in Chicago next spring, hope to see you then! Finished up the right swing arms today. Starting to setup the fixture for the 12 main leg supports. 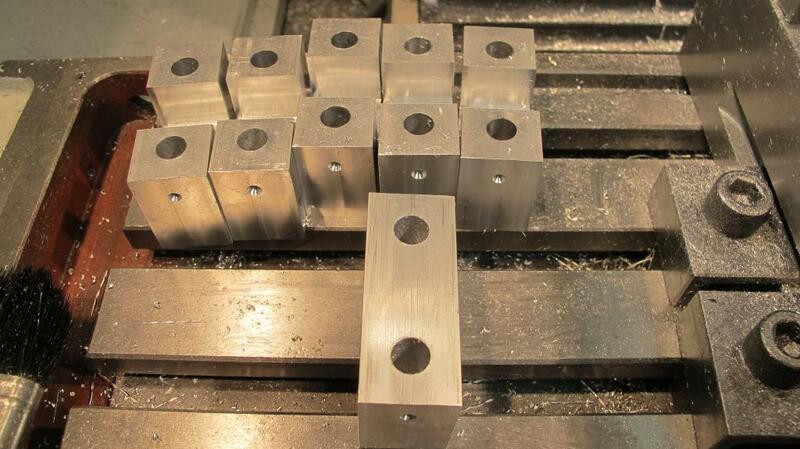 These pieces will be machined in 2 separate steps since they are too long. I'll machine one end completely and then slide the part over to finish the bottom half. The biggest issue is keeping the alignment the same for all parts. Since all the other parts attach to these, they have to be done right! The vibratory bowl is doing a fine job of demurring and leaves a nice finish, I'm now leaning towards anodizing over the stain finish, polishing is a lot more time and any remaining tool marks will stand out. I located a power supply online for the anodizing, will have to purchase that, dyes, sulfuric acid and some plastic tubs for setting up the anodizing line. I have 6 days before I go back to work so should get a lot done! Got 7 of the 12 leg supports done today. Would have gotten them all done but too many Christmas related interruptions! It took longer than expected to get everything going, the G code wasn't quite right so that took some work to get that figured out. Also had to take into account the clamps during machining when moving the drills and milling cutters to avoid collisions. Should be able to finish them up tomorrow. 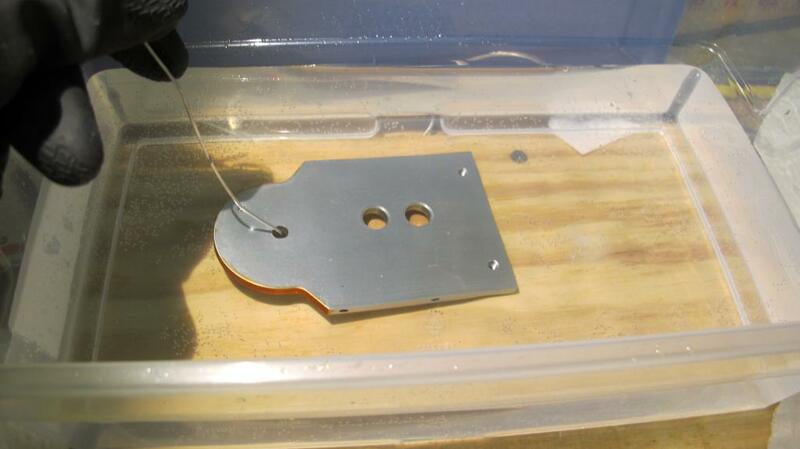 Next step is drilling and tapping the mounting holes in the sides of the swivel plates. That's 48 holes to tap, my hands feel tired already! The rest of the leg supports are done and got all the holes drilled. I was wrong on the number of holes to tap, it ended up to be 96 holes tapped for 10-32 screws. The tapping went much faster, I tried using my battery operated screwdriver/drill with the clutch set low. It was easier than I expected and faster this way too! Next part to mill is the motor mounts for the lift and swing linear actuators. This part has several steps to it, will be figuring out the most efficient way to make them. 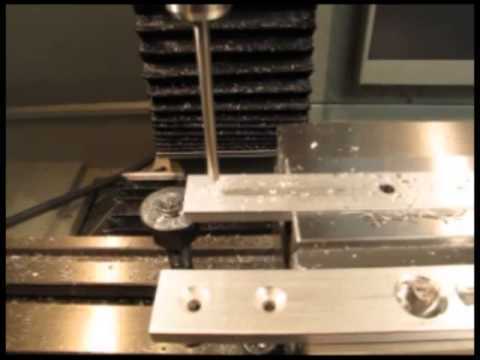 I plan on getting the 6 knees milled also, those can be fairly complex and the tolerances are a lot tighter on this part. I'll have some photos of the progress on the next update. Busy night last night, the wife gave the OK to play in the basement shop so I took advantage of the opportunity! Today has been less fruitful, I've been away from the house most of the day. Here are some photos to show the progress for the last couple of days. 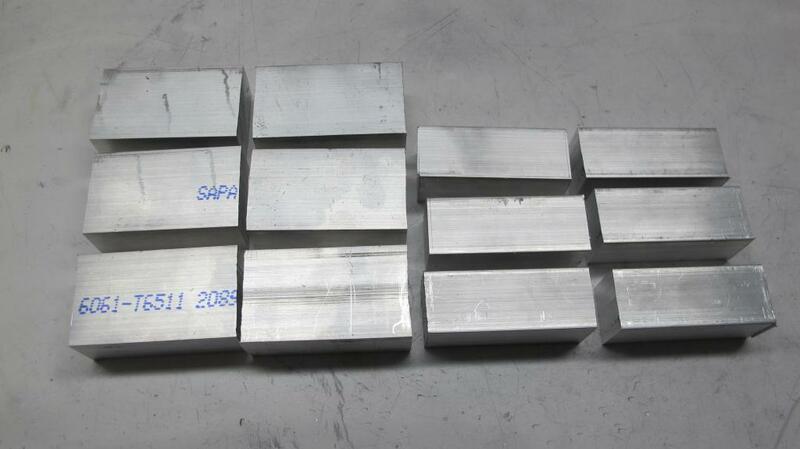 The first picture are the raw aluminum blanks for the upper and lower motor mounts. The next shows the blanks finished off to the 2.5" length. Holes are drilled through the parts for the mounting screws and a wider hole is milled to recess the screw below the hole for the shaft that the actuators attached to. I use an end mill to put a rounded arc on both ends of the blank (the photo shows a lot of tool marks due to chatter, got a lot of vibration due to the way I was clamping the part; this will require some filing and a few hours in the deburring tub!). This dimension is not critical so it shouldn't be an issue. I have to mill out the area in between the 2 rounded ends, that is where the actuator end is mounted. The photo with the long pieces are the main leg supports. These have an alignment slot at the top and in the middle. This keeps the leg swivels (in the next photo) at right angles to the supports. 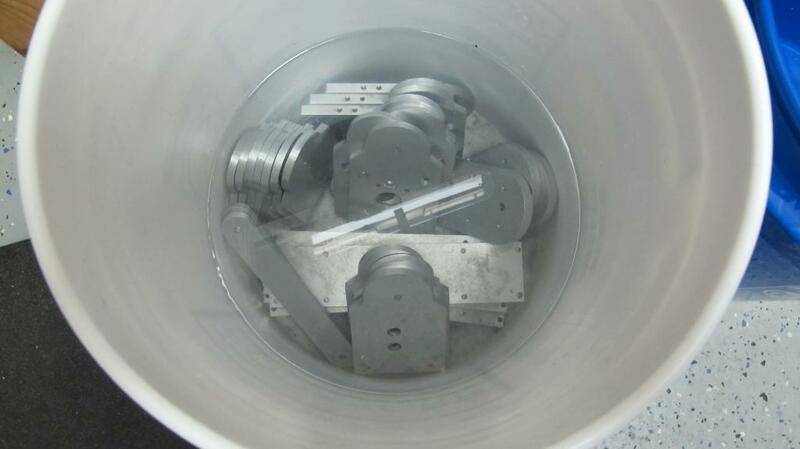 The last photo are all the parts as they are drying off after being deburred. They still need some cleanup but otherwise that is the basic finish prior to anodizing. Picked up 3 plastic tubs to use during anodizing, still need to get the sulfuric acid (NAPA carries it), distilled water, and dyes. I plan on placing an order for the dye this week so I can start experimenting with the new year. 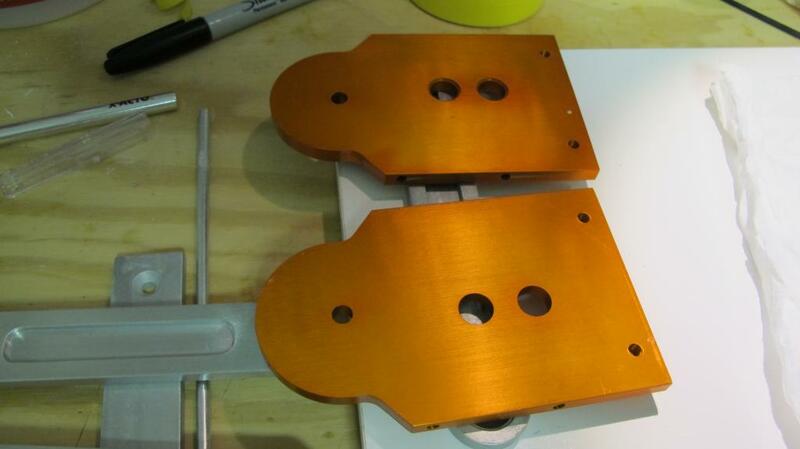 The motor mounts are done for the upper and lower actuators. 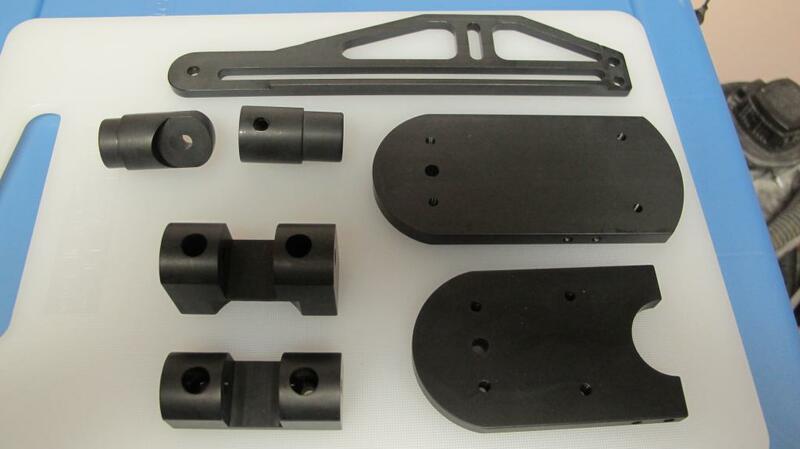 The one on the left is the lower mount and the right mount is for the upper actuator. The lower actuator mount is 1.5" tall vs 1.0" on the upper due to the need to clear the body swivel plate. The cutout on the bottom is an arc that the swivel can move inside without interferring with the mount. Started setting up the next re-design of the knee connector. This is another intricate part that requires a fair amount of accuracy since it houses the side impact sensor and the leg bottoming switch. I think I have the bugs from the last version figured out, will do another 3-D full size CAD drawing to verify clearances and then make one up this weekend. If it works then I create 5 more! Almost done with the heavy work on the mill. There are a few small pieces that are made from Delrin for the limit switches to go yet but the knee is the last aluminum mill piece. Next I turn to the lathe and start running the various spacers and actuator connectors needed. I think I counted up 12 lathe parts per leg. Much fewer than I needed off the mill but the lathe is manual only so it takes longer to reproduce pieces. Stopped at the local Auto Zone and got a batch of battery acid; it was cheaper than expected, only $3.99 for 1 quart. That will be diluted down using distilled water and put into one of the plastic tubs I purchased. I also picked up some Rit clothing dye to do some experimenting with. Rit dye is considerably cheaper then the commercial anodizing dye and I've read about some good results on the web. This will give me something to play around with until I get my technique figured out. The next thing I need is some pure aluminum wire, will get that from the hardware store today along with a several gallons of distilled water. I have a small constant current power supply I will use until I can get something more powerful but it should work out OK for testing on smaller parts. This should be fun, I've read up everything I can find on anodizing, now its time to put theory to practice! It took longer to machine the knee than expected but I finished up the milling on one, 5 to go. 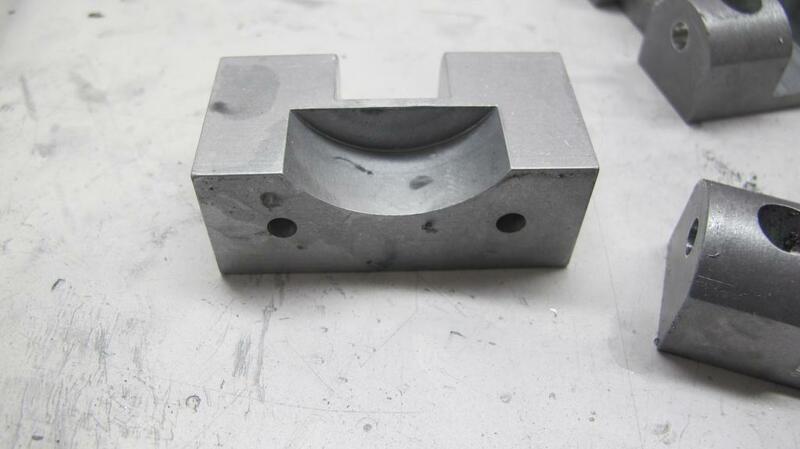 This part has some of the tightest tolerances and requires machining on all sides. Here is the 1.5" x 2" x 3.75" blank sitting on the initial design paper. I also drew it up in the CAD program but I can't find a way to export it as a JPG so this will have to do. The slits on the blank are for a piece that is parted off later in the machining process since it has to be perfectly aligned with the body. This part holds a o-ring that is used to help center the leg when there are no side impacts on the lower leg. The larger part was squared up on all sides to the correct dimensions then drilled for mounting holes in the corners and the center. 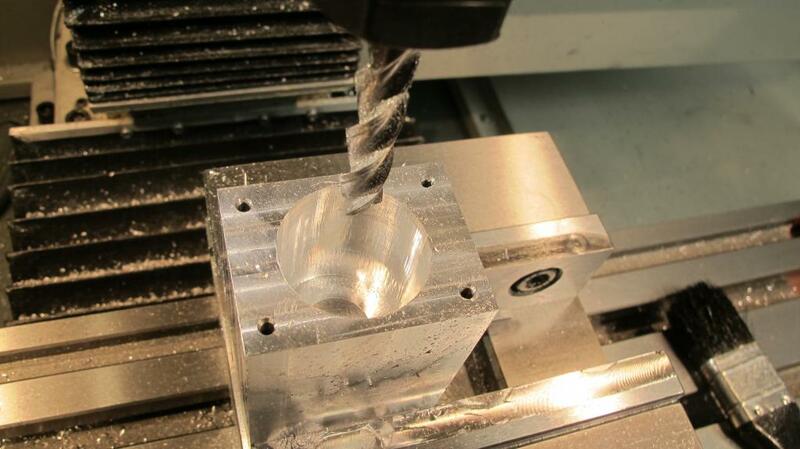 The center was drilled out with a 13/64th drill all the way through and then a carbide insert endmill was used to mill out the center hole to the correct depths and diameters. Additional mounting holes were made on the sides for the knee connectors to mount and a 0.125 x 0.45 slot was milled for the resistive impact sensor connector. I have the parts in the bowl being de-burred now. Doesn't look like I'll meet my goal of finishing up the milling before the end of the year but I was close! I'll work on the rest of them as time permits. 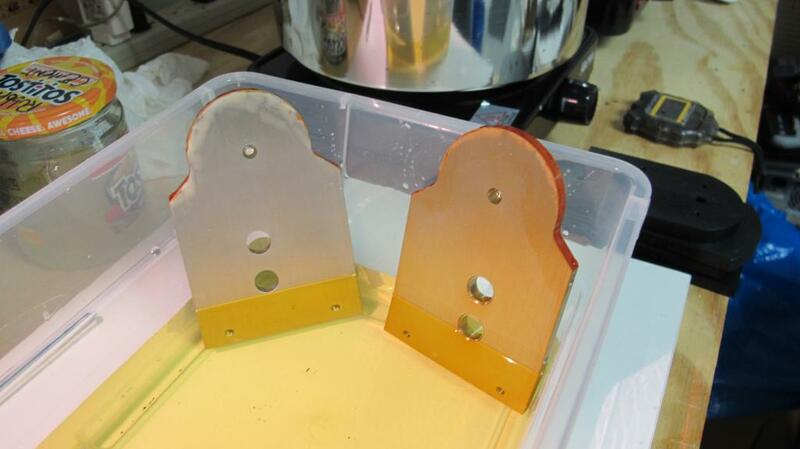 I'm ready to start setting up an anodizing line in the basement and trying this experiment out. Back to work this week and finished up some parts on the lathe. I have to assemble one of the new legs to get the final dimensions for the round leg connectors but I want to get the anodizing done first. I only want to put the bearings in one time. My wife gave me approval to use her workbench and now I'm setting up the anodizing line. 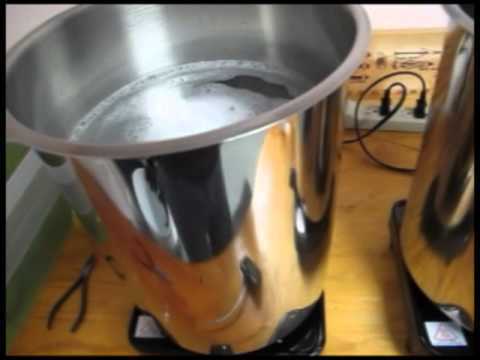 I've bought 20 gallons of distiller water for cleaning, anodizing, dyeing and rinsing. I need to dilute the Sulfuric Acid down and set up the anode and cathode from the power supply. Anodizing requires very clean parts, I'm using Simple Green to clean and degrease. A old toothbrush is there to get into the all the creases. 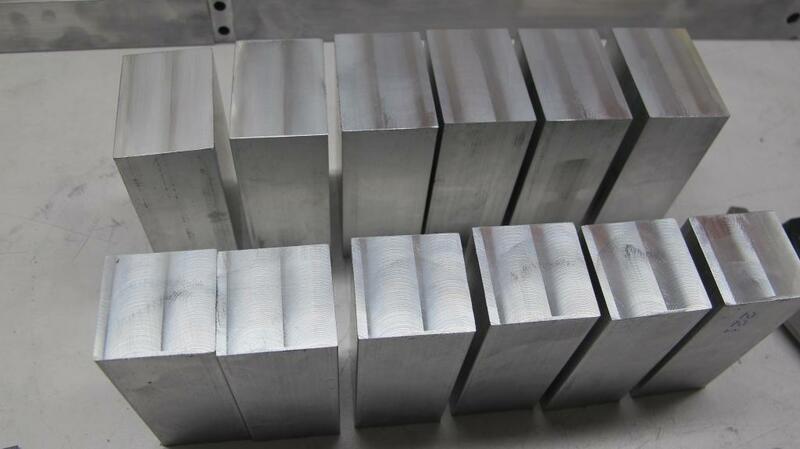 Once they are clean, the parts go into the acid bath at a constant current based on the number of square inches of the part. This also determines the time in the acid bath. Once done, the part is rinsed and then put into the dye. The last part is sealing the part which is done by placing the part in boiling water for a while. That seals the pores and locks the dye in. I'll shoot some photos as I experiment with the process and let you know how it's going! Def want to hear & see anodizing results. You make it sound easy! Kind of a quiet week, been working on a separate project for an up coming vacation, a camera tray for my underwater camera. 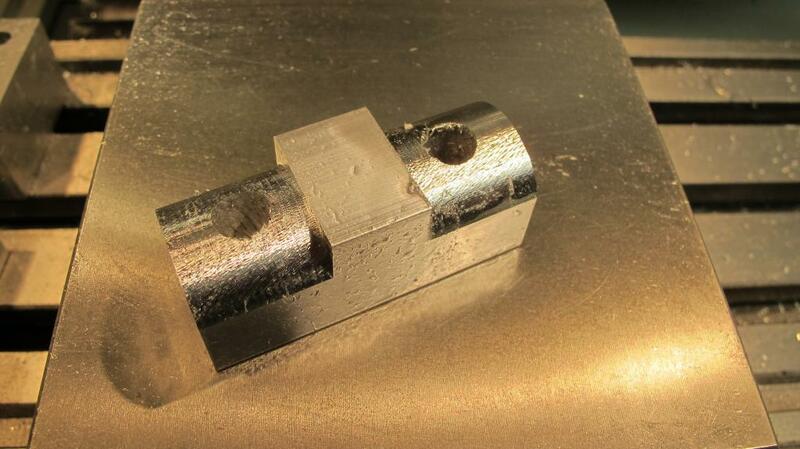 Finished the milling last night, deburring it over night and polish today. It will be one of the first anodizing items once the line is set up. Speaking of anodizing, I ordered commercial dyes, degreaser/cleaner and sealers. I need to have consistent results from the several dozen parts so a little less home-brew may be in order here. I came up with an idea that solves an image problem on the legs. I use 1 inch aluminum tubing for the lower extensions with Aluminum plugs at each end. A small screw is used to attach them together on the back side. I haven't really liked this arrangement but didn't have a better means of keeping everything in place. My idea is to drill and tap the plugs at both ends and use All-Thread rod to then screw the ends together. The All-Thread is hidden inside the tube this way, making for a cleaner look. I'll drill and tap the parts I've made so far today. 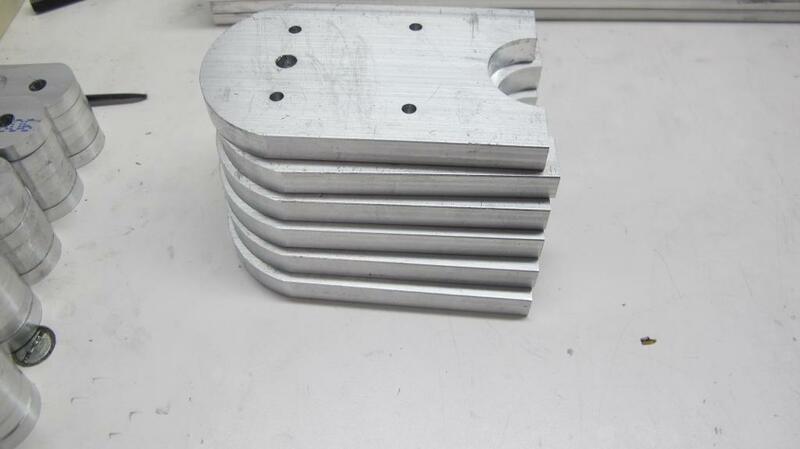 Today is also slated for lathe work for the lift motor attachments to the paragraph. This will be slightly different than the test leg, should be easier to machine and a stronger too. I too am looking forward to see how your anodizing works out. I recieved the anodizing supplies and was going to try my first anodizing trial over the weekend. I discovered a problem with the pans I was planning on using for heating the dye, sealer and degreaser were all aluminum and they need to be stainless. So back to the internet to order 3 12 qt stainless pots and electric heaters. In the meantime I got to work setting up the anodizing bath. This container is not heated but just contains the 12%-15% Sulfuric Acid mixture and the cathodes. There will be air agitation using an aquarium air pump included. 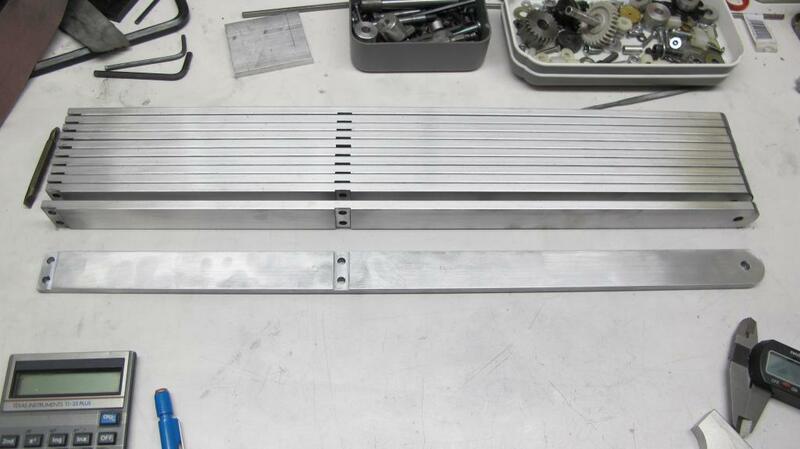 A aluminum bar that is drilled and tapped with stainless screws goes across the top and will be used to hang the items being anodized. The lead sheets in the bottom are the cathodes. Hopefully the rest of the supplies will show up this week. So I decided to do some more work on the lathe. I am working on the spool pieces that go into the knee connector block. There are 4 orings on each one that have to be precisely aligned in the knee. Here are some photos of the pieces. Here are some additional parts I made over the last week. The part to the right is the motor shaft adapter and the one on the right is the connector from the motor to the lift bearings on the pantograph. My workbench is starting to get crowded with all the parts for 6 legs. I'm going to have to move them somewhere else if I want to start putting the legs together. I'll report on the anodizing process when I finish getting everything set up. I got the heaters and the stainless steel pots are supposed to be delivered today! I mixed 2 gallons of Sulfuric acid into 2 gallons of distilled water and then added the mist suppressant. The anodizing bar is ready and wired up. My test parts are ready, just need pots! In the meantime I finished up the knee spool pieces. Next I'm cutting out the remaining 5 knees from stock so I can get those out of the way. 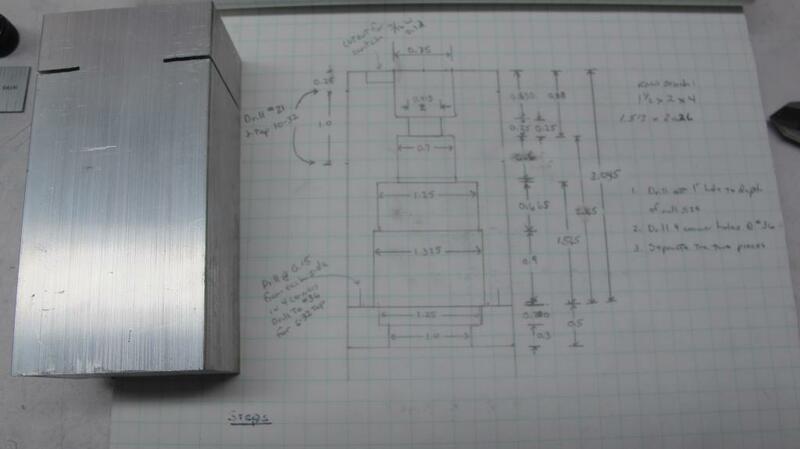 Still working on an updated design for the swing motor limit switch assembly. I want to use 2 limit switches instead of 1, just figuring out how to mount the switches and possible interferences. I may wait until I put together the first leg assembly for inspiration! I ran my anodizing line today and was successful! I put together a video of the process, here is making the first 2 test items. The process isn't too complicated, just a lot of setup and chemicals to heat to specific temperatures. The process uses a lot of distilled water and the end result is highly dependent of the ability to thoroughly clean the parts. The output finish is nice however the part's original finish shows through the dye. This means I have some additional work ahead of me to clean up the parts even more. Today was only using one color, black. I need another pot and heater to mix up another color so I only did parts that needed one color. I've ordered another stainless pot so that might be next weeks project to try two tone finishes. It turned out to be trickier than I expected to get the temperatures right for each solution. 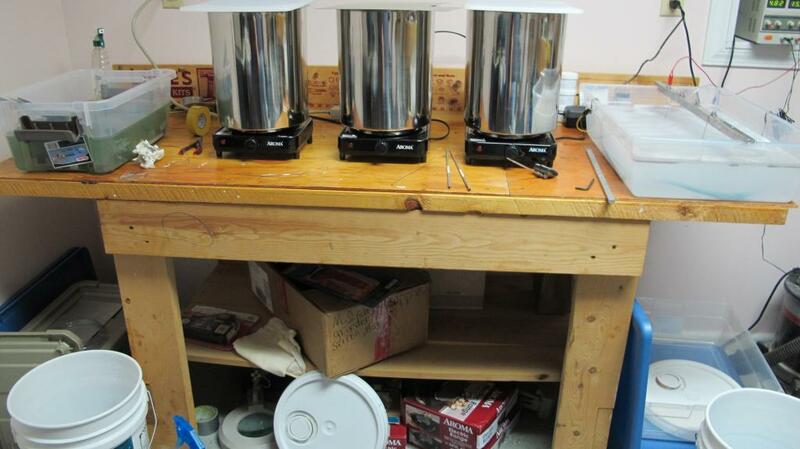 Plus I could only have 2 pots heating up at a time without popping the circuit breaker. Once the solution is up to temperature it wasn't as much of a problem keeping it there although I had to monitor the temps to keep from overshooting the target temperatures. I've learned a few things that I'll make adjustments for the next session. The titanium wire works great, much more reliable connection to the parts than using aluminum wire plus it is reusable where aluminum wire is good for only one shot. Here are some photos to go along with the video. 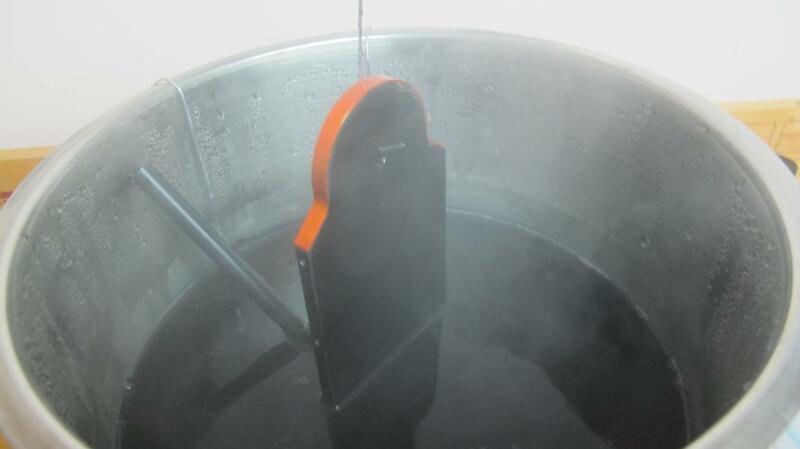 The first photo is the anodizing bath in full swing. 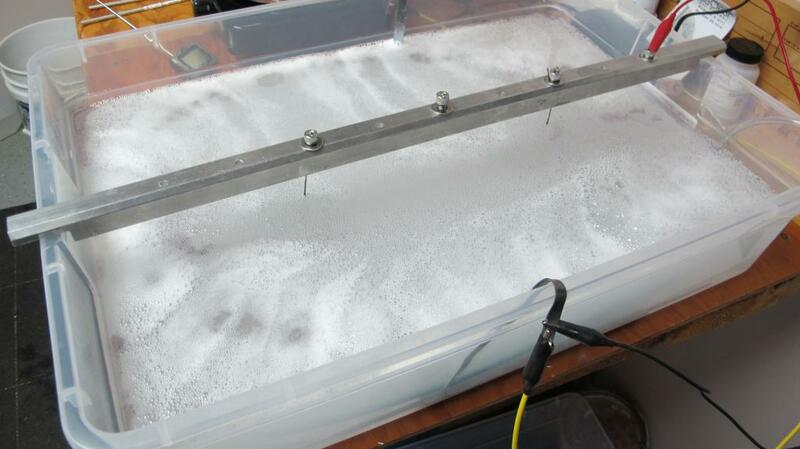 The foam is from an aquarium air bubbler line to provide agitation. 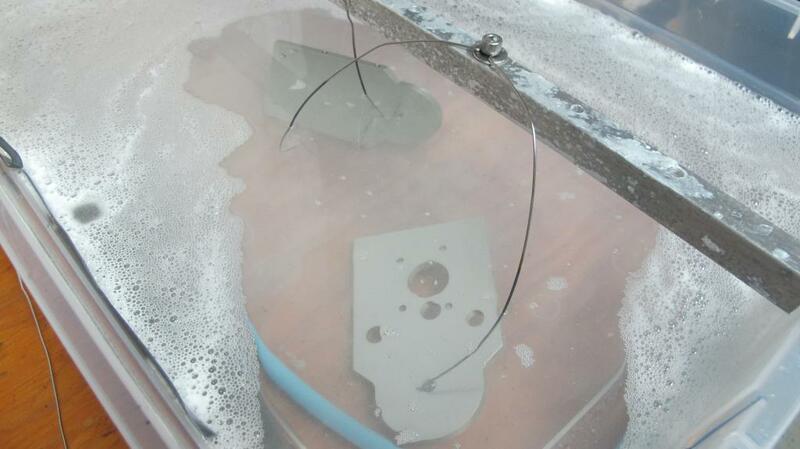 There is also hydrogen bubbles from the cathode and anode. 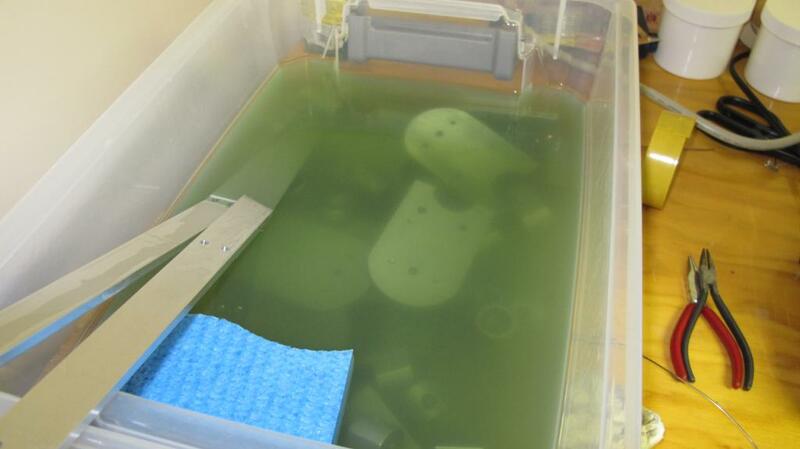 The 2nd photo is the cleaning station, Simple Green and distilled water. The 3rd photo is the whole workbench and the various stations. The 4th photo are the titanium wire connectors and the last photo are the parts I anodized tonight. These are drying overnight and then I will wipe them down with WD-40 to get a nice shine. Overall I am pleased with the results and looking forward to getting parts anodized. This is going to take some time since my power supply is limited to 5 amps so that limits the number of parts that can be done at one time. With the current density set for 12 amps per square foot I can only do a maximum of around 55 square inches and keep the time at 1 hour. I could double the square inches by going to 6 amp calculation but the time increases to 2 hours. Either way this is going to take some time! So this can be done at home but I recommend studying the process and be prepared to spend more than you expect! Another nice thing is that all the chemicals can be put into sealed containers and stored away for use later. It will be just a matter of setting up the stations again and I'll be ready to go. I'm no longer limited to what kind of finish I want on aluminum, pick a color! I did my first two color anodizing and it looks like I need to practice some more! I used 2 different methods of masking, rubber cement and a commercial masking tape. The rubber cement method was harder than expected and I got the cement in places I didn't want it. Plus it was hard to remove. The masking tape requires cutting out the shape with an Exacto knife and closely fitting it into the cavity. The rubber cement method has some possibilities, I've since learned that I need to thin it down quite a bit and then try painting it in the cavity. Use paint thinner to remove the cement later. The masks have to be put down exactly and burnished to keep the dye from seeping under the mask. I'll give it another attempt this weekend and see if it goes better this time. I think I'm going to use black dye for the majority of the parts and use the Gold dye to highlight specific areas. This will be a long process and will take several weekends. I'll dye all the parts for one leg and then put it together so I can see if I'm getting the look I want. If its good then there are 5 other legs waiting their turn! It doesn't look like I'm going to be able to attend the Chicago Propellor Expo, I'll be in training for my day job so the first showing of the completed mechanicals for the robot will be Norfolk. I still have to design and build the circuit boards so programming will mostly have to wait for next fall. 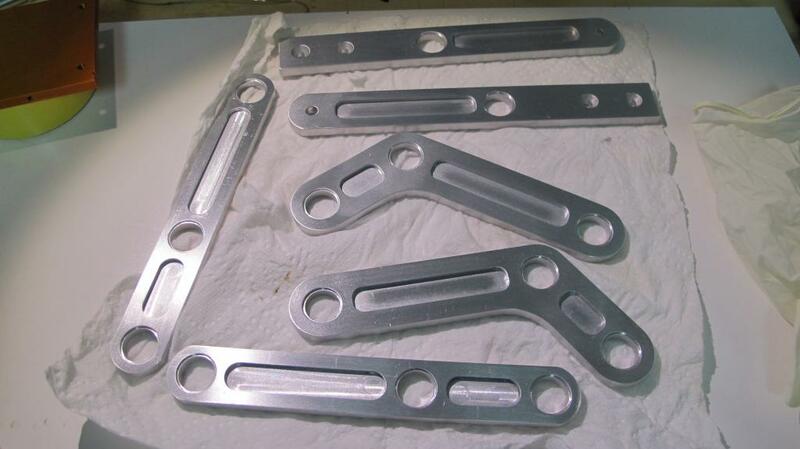 Anodizing is a process that purposely electro-chemically grows a porus oxide layer in aluminum. This is a Type II anodizing setup so the oxide layer is only about 0.001 inches thick but is much harder than the underlaying aluminum. The fact that the layer is porus allows organic dyes that are molecularly small enough to fit into the pores so the parts can be dyed different colors. This color layer can't be chipped or scrapped off (it can be chemically removed or rub enough with sandpaper and it comes off). I'm getting better at the 2 color anodizing. There are a lot of steps involved with doing extra colors but I'm slowly working out a technique that works for me. Setting up to do parts that contain bearings. This requires the bearing hole be masked so they don't anodize and change dimensionally; I'm using rubber cement diluted down to a water consistency using Toluene (I tried another type of paint thinner and just got a weird ball of rubber cement instead). Basically after the part is anodized I put the part in the lighter color, gold. This done for a fixed amount of time so the shade of gold is consistent (learned that lesson the hard way, set a timer that makes noise, too many distractions!) You can see the mismatched color in the parts in the back. The part is then put into pure bleach which bleaches out the color within a couple of minutes. There is still a hint of gold in the part. The bleached part is put in a 15% sulfuric acid solution to re-open the pores. This really cleans out any remaining dye and leaves only the oxide layer. This step only takes a few seconds, you don't want to leave the part in the acid as it eats away the oxide layer also. Very important to rinse the bleach off completely, Sulfuric acid and bleach = Chlorine gas! very bad for your health! I will mention that in between each step the parts are rinsed off using a spray bottle of distilled water and then dunked in a pail of distilled water. Gloves are used in every step to keep finger oils from being absorbed by the oxide layer. It doesn't take much to get a mark on the part that doesn't even show up until the end! Next the part is put into the sealer that closes the pores and locks in the color. 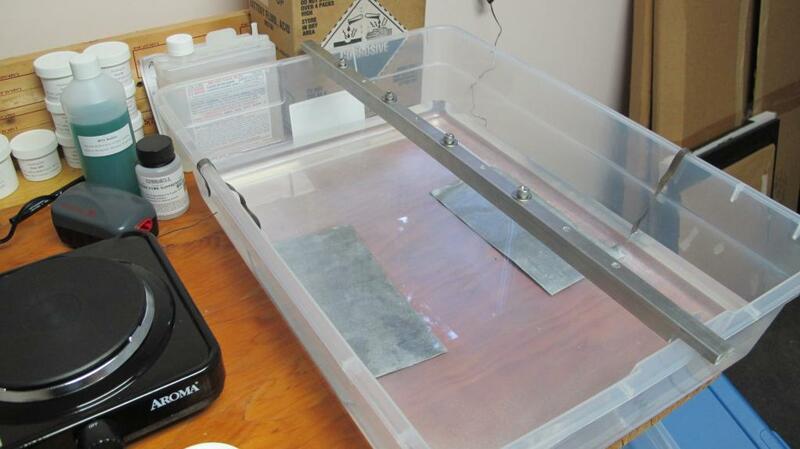 The part is put into a container of Toluene to dissolve the rubber cement. I put the part back into the sealer solution for another 10-15 minutes to make sure the pores under the rubber cement are fully closed. This is a long process but the results look nice. Lots of parts are in the bucket ready to be anodized. 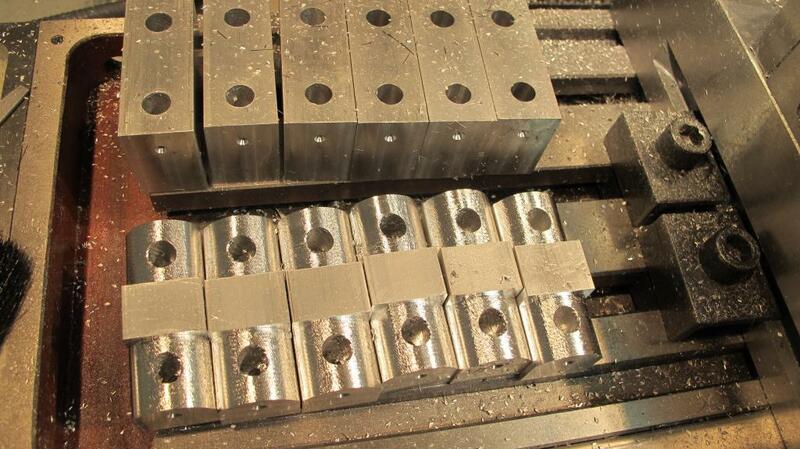 My prep work for anodizing is tumbling the parts for 8-12 hours in a vibratory bowl to remove machining marks. Next the parts are hit with a cloth polishing wheel with some aggressive polish. This step adds a mirror-like finish that is taken off using a 240 grit scotch brite pad in my power drill. This results in a brushed aluminum look. The parts are scrubbed and cleaned in Simple Green and then on to the Degreaser/De-oxidxer. This only takes 2-5 minutes and can dull the finish if left in too long. 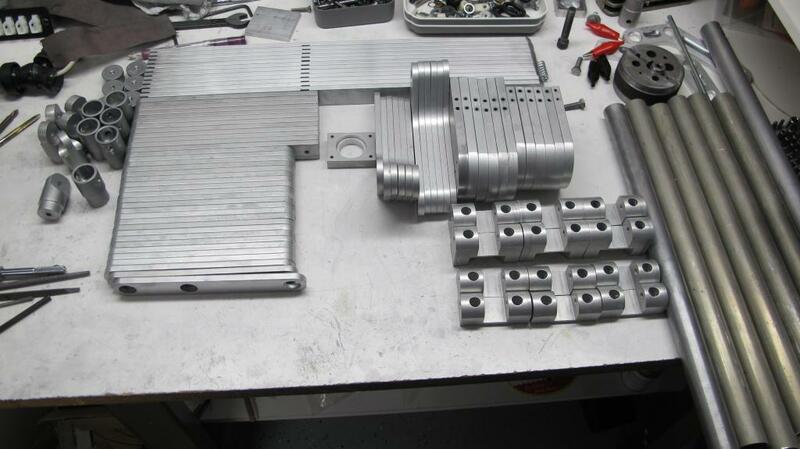 Now the parts are ready to be anodized. The middle photo are 2 parts being anodized in the acid bath and the last photo is taken right after being pulled from the bath. 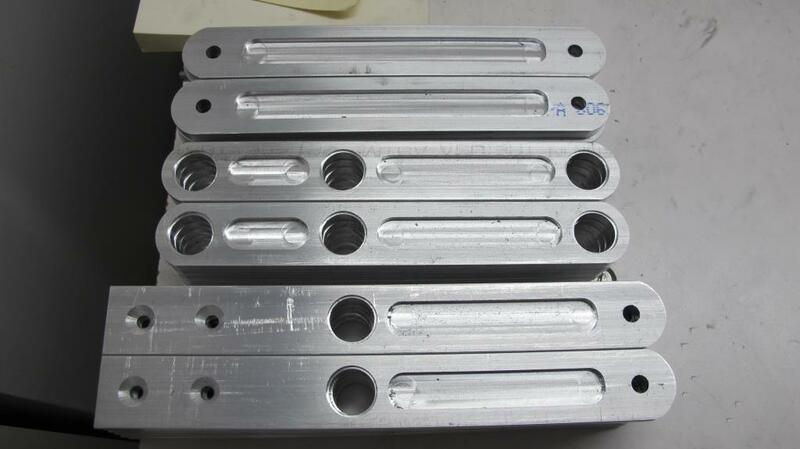 There is a pale yellowish color that helps identfiy that the part was anodized. 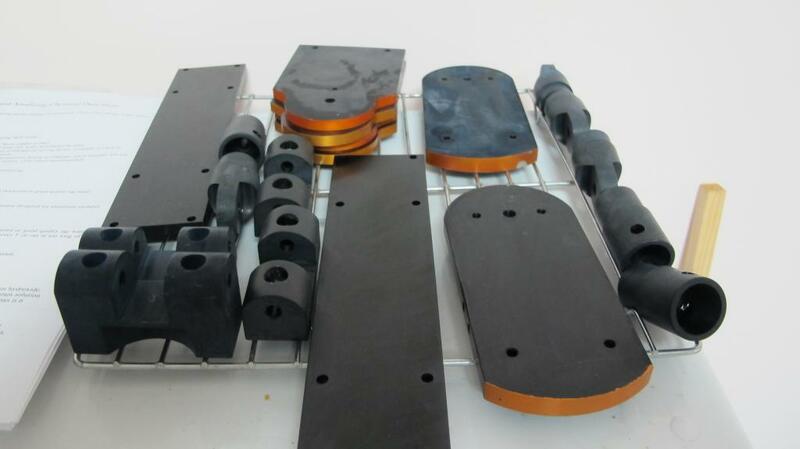 Anodizing can be done at home but it requires a lot of chemicals and time and temperature sensitive processes. It's required several trips to local stores for everything from 5 gallon pails to Toluene, battery acid and lots of distilled water. I'm afraid to add up the reciepts but I'm sure they are several hundred dollars by now (good thing the wife is very understanding - not that she actually understands what I'm doing but she understands hobby needs!). They are all re-usable so when I'm done with anodizing the robot parts, all the chemicals will go into labelled and sealed 5 gallon pails and stored in the corner until the next time I want to anodize. Bob - getting late, time to pack it in and start tommorrow. Tonight was spent removing the anodizing from 20 pieces that didn't turn out correctly. This involves putting the anodized parts in Sodium Hydroxide or lye. Since I couldn't find lye at the store I used Drano which contains this chemical. It requires about 1/2 hour or more to strip the anodized layer off. Using a scrubbing pad helps speed up the progress. Since the fumes can be intense, I did this outside on the porch. Unfortunately it was 33 degrees outside. I found that the rate of stripping decreased as the parts were scrubbed, I finally stopped when the stripping had slowed down and it was getting time to get ready for bed. You can't just leave the parts in the solution since it also eats aluminum so a careful watch is needed to make sure critical dimensions are not impacted too much. I used White Vinegar to rinse the parts and stop the reaction followed by a fresh water rinse. The parts are now drying and will be processed along with the rest of the parts. I'll be taking a bit of a break to head to warmer climates for a bit so this weekend will be the last one for full scale robot work until I get back. I'll see what I can get done and post some progress photos. I think I've got my technique for using the anodizing masking tape down now. I was running with a >50% redo rate and the last 2 nights I only had 2 that were marginal. I also was introduced at the specialty hardware store to some nice 2" sanding pads that really sped up prepping the aluminum and got a nicer finish as a bonus. I was ready to start putting together some of the anodized pieces and decided to make a video for the process. The look of the robot is pretty nice now. I found a good polish that really brings out a nice shine and helps reduce fingerprints from handling the parts. Still a long way to go with preparing the parts but things are moving along nicely. I hope you enjoy the video, I'll do more videos on building the legs up and installing them to the robot body. Wow! Absolutely top notch work Bob! The two-tone arms in the back are fantastic looking! Someday I will try to get an anodizing system put together but for now I'll have to stick to powder coat and keeping mating / bearing surfaces masked. I really dig the black color. I may go black powder for my parts too with some yellow highlights. Very impressive looking work man. Nice work! I'm also very impressed with the two color anodizing! I used to have a more commercial anodizing setup, I never tried two colors before. But I think you have a very workable technique. Are you going to bring your finished product out here to Parallax? We would love to see it! With the final expected size of this I'd have to buy an extra seat on the plane, it won't fit in my carryon! I will be taking it to the Norwalk Prop get together this fall, it should be together mechanically. I'm not promising that it will be moving on its own yet by that time. 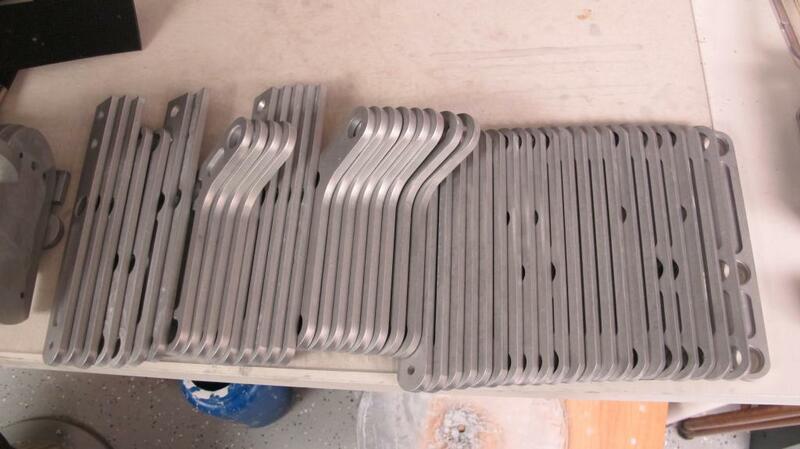 There are still a lot of parts to anodize, polish and then assemble. Along with the additional mill and lathe work that needs to be done it will be a full summer. The robot is looking better than expected, now here's hoping it works just as well! The anodizing was fun to figure out and gives me another metal finishing method. I've got some new ideas for multi color parts on future projects now. I've got 8 dye colors available, could have some interesting results later. Bob: Stunning work, as others have noted, your anodizing quality and color mix look utterly fantastic. It's great to see you giving such marvelous attention to aesthetic details in the midst of such a huge project that might easily overwhelm! Keep it up, I'm a fan. Could you Anodize my life? That is "Tight" bro... Black and Gold very cool. Sorry for the slang, but thats all I got right now, cuz I allready used up "GO! BOB GO!".. I think I've got it bad; I'm on vacation, warm weather, great diving and I'm spending my spare time planning my next steps on the robot when I get back home! Is there a cure or is it incurable ( don't let my wife know if there is a cure!). I am researching new metal lathes, I've out grown my Sherline lathe, time for something larger and beefier. I've seen a couple of possibilities with my current favorite being a Precision Mathews PM1236. The Tormach folks that made my CNC 770 mill are getting a CNC Lathe ready but it wont be ready until later in the year, I'm not sure I can wait that long. 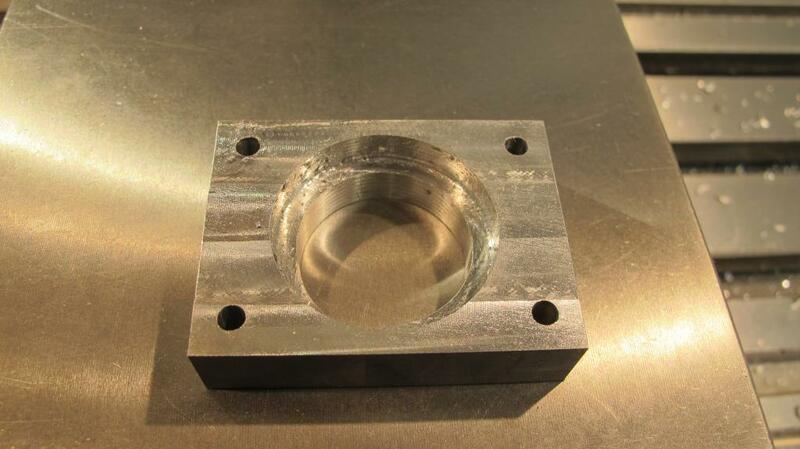 CNC lathe would be nice but expensive. I do have some ideas for the next level above the power distribution area, this is where most of the electronics will be mounted. The area to play with will be 15 inches across (hexagon) and 4-6 inches high. I want to top that with a 12 inch clear acrylic ball and have a pan and tilt camera mounted in the ball. Just to let you know I haven't disappeared for good! I'm back from vacation and into the basement I go. 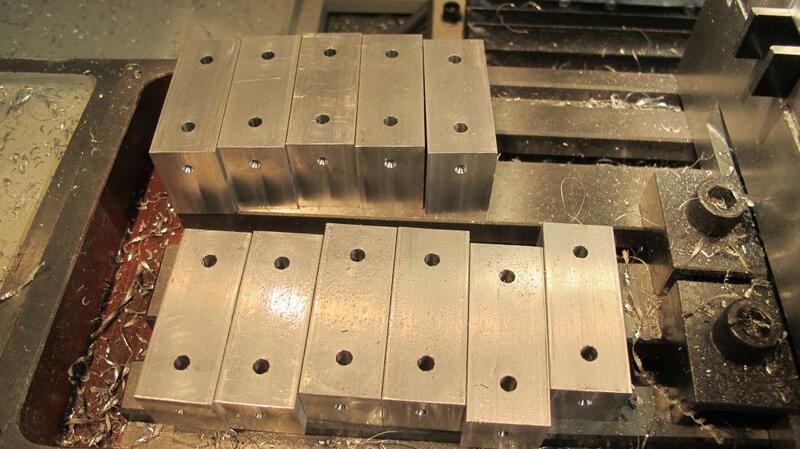 Last night was spent putting a 'shine' on machined parts in preparation for anodizing this weekend. I have quite a stack of parts ready to go, just have to fire up the anodize and dye tanks! I put in an order for a PM1236 metal lathe with DRO (digital readout). It should be arriving mid April so I have to re arrange the basement again to make room. It's well past time to retire my current hobby lathe as I outgrew it a while back. I need to put it and my old CNC mill on Craig's list sometime this summer to help finance the robot! I'll have some photos soon of the build of a leg, in the meantime I'm still sorting out the whale and underwater photos from vacation. Am on night shift for the next 5-6 weeks which puts a crimp in some plans but I should have time to get robot stuff done.